The V&A Waterfront is a world-famous attraction in Cape Town, and with good reason. It all started off with a small jetty, built by Jan van Riebeeck back in 1654. In 1858, serious winter storms wrecked more than 30 vessels. Consequently, Lloyd’s of London refused to cover ships wintering in Table Bay. On a particularly sunny September 17, 1860, Midshipman HRH Prince Alfred, Queen Victoria’s second son, tipped the first load of stone to start construction of the breakwater for Cape Town’s first harbour, which would eventually become the V&A Waterfront. Today, this mixed-use area has a focus on tourism, retail and residential developments, attracting people from all over the world in search of experiencing one of the most magical locations in Cape Town. Many people choose to extend their experience of the Waterfront by taking a boat cruise from the harbour. There are many options available, from sunset cruises departing from the Waterfront, to floating restaurants merely moored at the V&A. By far one of the most popular choices of boat cruising from the Waterfront is sunset cruises. We offer a sunset cruise that takes you straight to Clifton 4th Beach, or to Table Bay, depending on the weather on the day. Once we arrive at the destination, you get to enjoy and take in the beautiful scenery before you, while sipping on a delicious glass of Méthode Cap Classique sparkling wine. After this, we slowly make our way back, cruising gently as the sun sets to the city lighting. You’re in for a first-class experience, with Table Mountain and the 12 Apostles keeping vigil as our exquisite backdrop. It is a boat cruise ideal for any romantic at heart. With this 90-minute cruise, you can look forward to experiencing Cape Town like no other way permits. If you’re looking for a unique venue to host your special occasion, you’ve found it. 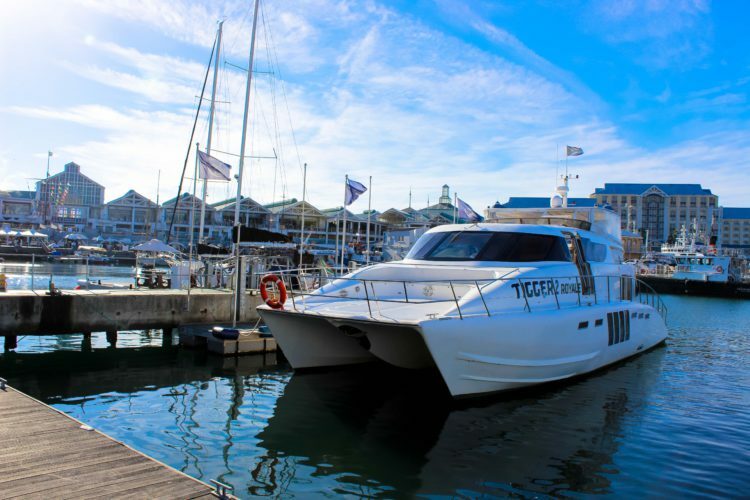 Our Tigger 2 Royale power catamaran can cater for up to 65 people on our lunch and dinner cruises. We offer a choice of duration and a variety of delicious menu options sure to cater for all tastes. Enjoy and take in a scenic bay cruise that departs from the V&A Waterfront, and take in the beautiful views of Lion’s Head, Table Mountain and Signal Hill, as you and your guests tuck into a delicious meal. Contact us to book your boat cruise at the Waterfront today, and avoid disappointment by securing your booking early.